70 years ago on January 1, 1945, Felix A. Cizewski, was promoted to Private First Class. He was serving in Company C, 3110th Signal Service Battalion, Army Service Forces in Paris. He was in a hospital recovering from frostbite. He is my late father. 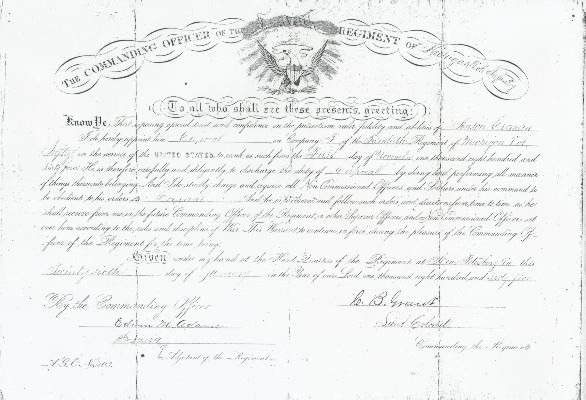 150 years ago on January 26, 1865, Anson Croman was promoted to corporal. He served in Company F, 20th Michigan Infantry Regiment, Second Brigade, First Division, IX Corps, Army of the Potomac. At that time the 20th Michigan was part of the Union siege of Petersburg near Battery Nine just south of the the Appomattox River on the northeast edge of the city. Anson Croman is Cheryl A. Robinson’s 2nd great-grandfather and my 2nd great-grandfather-in-law. RIGHT: Official certificate of promotion. 150 years ago Anson Croman and the 20th Michigan Infantry Regiment continued to serve in the Siege of Petersburg Virginia, south of Richmond. By August, 1864 they could only muster about 85 men for duty. When the 20th Michigan began service in July, 1862 it had 1012 enlisted men and officers. After the defeats in June and July, 1864, General Grant ceased frontal assaults on the Confederate defenses of Petersburg. Instead he sought ways to cut off the railroads supplying Richmond and Petersburg and force the Confederates to extend their lines to the breaking point. 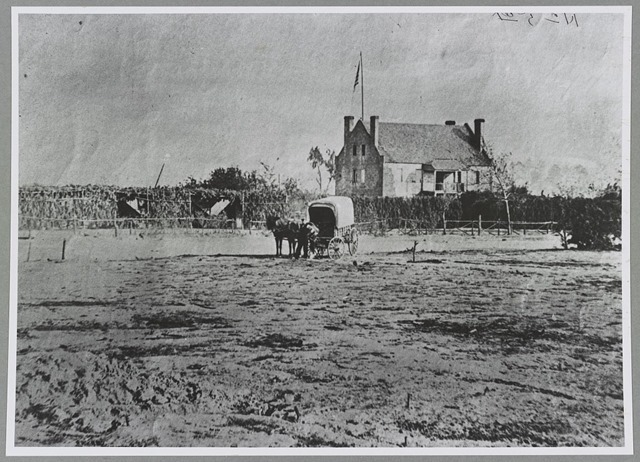 August 19 to 21: The Weldon Railroad south of Petersburg connected the besieged Confederates with their last major port of Wilmington, North Carolina. After a series of battles, the Union captured a section of the Weldon Railroad. That forced the Confederates to extend their trenches, unload their supply trains further south, and haul supplies by wagon using a longer route to the west. Globe Tavern on the Weldon Railroad Battlefield. Public domain photo from the Library of Congress. August 25 During the Battle of Ream’s Station, the 20th acted as rear guard for the II Corps. 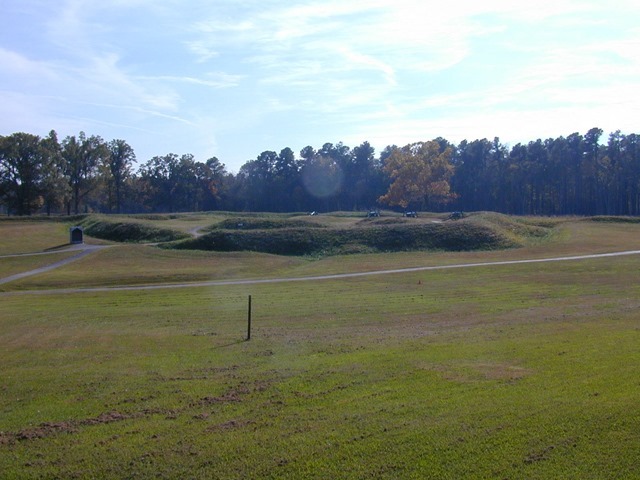 August 26 until September 30: The 20th was among the units that constructed fortifications to hold the captured sections of the Weldon Railroad southwest of Petersburg. September 30: Battle of Poplar Springs, Church, Virginia. Captain Blood and Adjutant Siebert of the 20th Michigan were among the fatal casualties. October 2: Skirmish at Pegram Farm. October 8: Reconnaissance in force on the Boydton Plank Road. 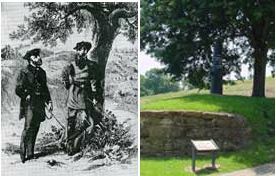 October 27 and 28: Battle of Hatcher’s Run, Va.
During this period Col. Cutcheon was promoted to command of the 27th Michigan and Major C. B. Grant became commander of the 20th. Col. Cutcheon’s history is among the sources used to tell Anson Croman’s story. November Presidential Election: Results from the 20th Michigan: 153 for Lincoln and 35 for McClellan. The number of troops who voted (188) is higher than the number of men available for duty as it probably includes soldiers convalescing from wounds and disease. About November 30: The 20th Michigan was transferred to Battery Nine on the extreme right of the Army of the Potomac along the Appomattox River. The story of the Twentieth Michigan infantry, July 15th, 1862 to May 30th, 1865. Embracing official documents on file in the records of the state of Michigan and of the United States referring or relative to the regiment. Compiled by Bryon M. Cutcheon. Record of service of Michigan volunteers in the civil war, 1861-1865.Michigan. George H. Turner, Adjutant General’s Office. On May 4, 1864, General Grant began the Overland Campaign which would lead 11 months later to the capture of the Confederate capitol of Richmond and the surrender of the main Confederate army in April, 1865. The Overland Campaign lasted until June 12, 1864. Anson Croman served in the 20th Michigan, IXth Corps. Undated photo of Dwight J. Brewer (1842 to 1881), Company F, 20th Michigan Volunteer Infantry Regiment. None of Anson Croman’s, our Civil War ancestor, letters if any have survived. However, the letters of Dwight D. Brewer from Jackson, Michigan who served with Anson in Company F, 20th Michigan Infantry Regiment have survived. His 2nd great-granddaughter, Professor Dennette D. McDermott, just published facsimiles of her ancestor’s CIvil War letters. In his letters Dwight does not mention Anson Croman. However Dwight’s letters give insight into both the routine and the combat experiences that Anson would have shared and reported home to family and friends. A model for sharing family history artifacts. While Dwight’s letters may be a historical footnote in the Civil War’s broader context, they are deeply meaningful to families such as ours who have no other way to get such an intimate and personal look at what our ancestor experienced. For that we are very grateful to Professor McDermott’s sharing. The same occurred with my late father’s WWII service. If he wrote letters home none have survived. As did Professor McDermott, another family shared with my family a privately published collection of letters from their family member who served in the same battalion but different company as my late father. What Professor McDermott has done is a model for what other families can do with their historical artifacts especially letters. Too many are sold to private collectors or simply thrown away. Such items are best donated to historical societies, archives, libraries or museums where they will be available for other families researching their history, especially those such as mine with holes in our family’s records that can only be filled with the help of other families. In late 1863 at Knoxville, Tennessee Dwight contracted smallpox and remained in a hospital when the 20th Michigan was redeployed to Virginia. For the rest of the war, Dwight served at Knoxville. After his recovery his duties included growing vegetables for the patients in the hospital. As a farmer, he’d have been skilled at that. At the end of the war, he was discharged from Nashville and returned to Michigan. Dennette D. McDermott at the Michigan Memorial, Vicksburg National Military Park, Mississippi. Our ancestors served together there from June to August. 1863 prior to their deployment to Knoxville, Tennessee. Painting by Greg Harlin of the November 29, 1863 attack showing the 20th Michigan’s position. Greg Harlin based his work on illustrations, photos, original letters and diaries, older paintings, and military diagrams. Fort Sanders on the northwest corner of Knoxville, Tennessee with the November 29, 1863 position of the 20th Michigan and the direction of the main Confederate attack. In August 1863, after the fall of Vicksburg, Mississippi, the 20th Michigan returned to Kentucky. In October, the 20th Michigan crossed through the Cumberland Gap to eastern Tennessee. Many people in eastern Tennessee were strongly pro-Union. One of President Lincoln’s priorities was to secure the area and provide them protection from the Confederates. In September 1863, after the Confederate victory at Chickamauga, Georgia, the main Union army retreated to Chattanooga, Tennessee. The Confederates cut them off and placed Chattanooga under siege. At the same time, a large Confederate force commanded by General James Longstreet moved into eastern Tennessee. The Union forces, including the 20th Michigan, withdrew to defensive positions in Knoxville, Tennessee. By November 25, 1863, reinforcements under General Grant defeated the Confederates besieging Chattanooga. That freed Union forces to relieve those cut off in Knoxville. 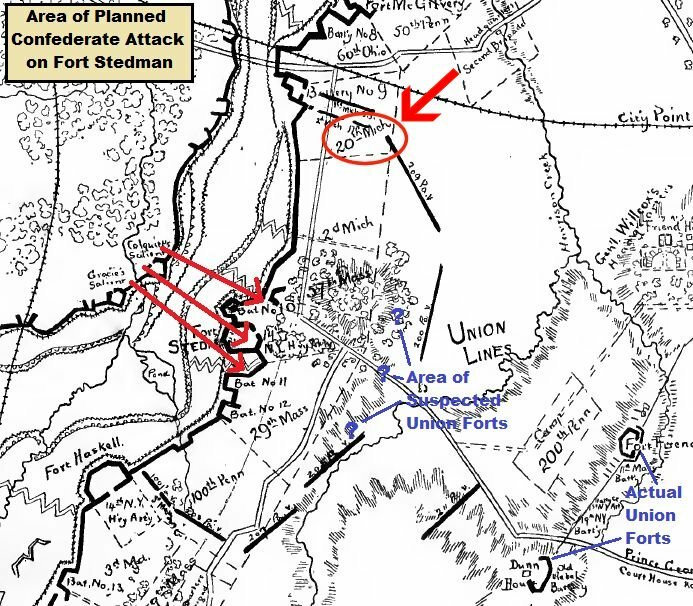 Aware that Union reinforcements were on their way, the Confederates decided to assault what they hoped was the weakest point of Knoxville’s defenses, Fort Sanders on the far northwest corner of Knoxville. 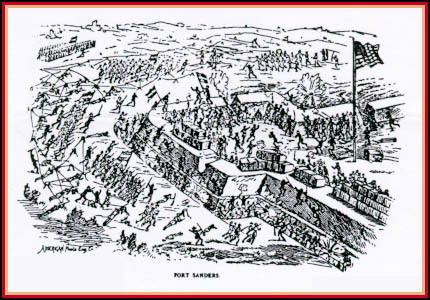 Before the attack, the Union soldiers soaked the sloped dirt walls of Fort Sanders. After the water froze the icy slope would be even more difficult for the Confederates to scale. 150 years ago on November 29, 1863 the Confederates attacked and failed in their attempt to take Fort Sanders. The 20th Michigan suffered 19 casualties, with two killed, eight wounded, and nine captured. Drawing illustrates almost the exact position of the 20th Michigan during November 29, 1863 Confederate assault on Fort Sanders, Knoxville, Tennessee. As commander General Grant was responsible for the Union’s July victory at Vicksburg, Mississippi and the November victories at Chattanooga and Knoxville. President Lincoln recognized that and promoted General Grant to General of the Army of the United States. From that position General Grant applied his winning strategies and tactics to lead the Union armies to victory over the Confederacy eighteen months later. Left: Sketch of Union General Grant discussing Vicksburg’s surrender with Confederate General Pemberton 150 years ago on July 3, 1863. Right: Surrender discussion site today. During the observance of the 150th anniversary of the 1863 Battle of Gettysburg the question is again asked: “What if the Confederates had won?”. The most likely scenario after a Union defeat at Gettysburg is that the Union army retreated intact and in good order to its next planned line of defense at Pipe Creek, Maryland, 12 miles southeast of Gettysburg. 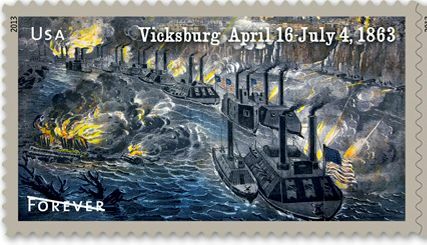 Vicksburg, Mississippi would still surrender on July 4, 1863. Along with the city and its 30,000 defenders, the Confederacy lost control of the Mississippi River and was split in two. The eastern half was now cut off from desperately needed reinforcements and supplies from the Confederacy west of the Mississippi. Even with a Confederate victory at Gettysburg, those losses were probably a mortal blow from which the Confederacy could not recover. President Lincoln would have been used the victory at Vicksburg to offset a defeat at Gettysburg. He would still have held the Union together and kept it in the war until the army in the East recovered and resumed the offensive. Credible alternate history scenarios are best when they are based as much as possible on the historic record. Less credible are dramatic scenarios that deviate significantly from the historical record. Such a deviation would be a massive Confederate victory at Gettysburg that completely destroys the Union army, winning the battle, the war, and Confederate independence. My alternative scenario assumes that the Confederates did just slightly better and the Union just slightly worse than both did at the actual battle. Prior to Gettysburg the Union army lost most battles in the East (but not in the West). The Union’s retreat after its defeat at Second Battle of Manassas in late August, 1862 was its most disordered. The Union army recovered in two weeks. By mid-September it was able to stop the Confederates along Antietam Creek in Maryland. That allowed President Lincoln to issue the Emancipation Proclamation. After suffering a horrible defeat with heavy casualties at Fredericksburg, Virginia in December, 1862, the Union army stayed in place, remained a serious threat, and resumed the offensive five months later at Chancellorsville, Virgina. After again being defeated at Chancellorsville in May, 1863, the intact Union army withdrew in good order to strong defensive positions that continued to threaten the Confederacy. A few weeks later, when the Union detected the Confederates moving north, they immediately began a pursuit and caught the Confederates at Gettysburg. A reasonable assumption is that the Confederates would have suffered the same losses to achieve victory as they did in defeat. Along with losing up to 1/3 of its troops, the Confederates used almost all their ammunition. As they were at the end of a very long and tenuous supply line, restocking their ammunition so they could follow up their Gettysburg victory would have been very difficult. The 2/3 of the surviving troops, almost all of whom had taken part in at least one day of fighting, were exhausted. Many of their horses, critical to Civil War battles, had been lost and the survivors exhausted. The Confederates could continue to feed themselves from what they could seize from the Pennsylvania farmers. The Confederates ability to replace their Gettysburg losses was made almost impossible by the loss of another 30,000 Confederate troops captured at Vicksburg on July 4. The Union army would also have lost 1/4 to 1/3 of its troops and a significant number of its horses. 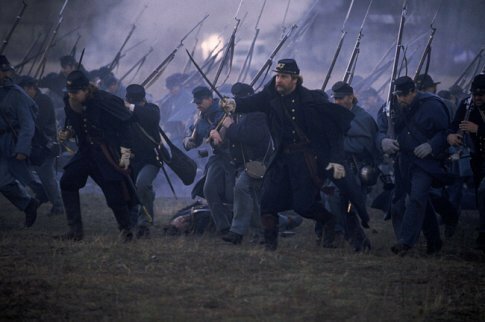 In the historical battle of Gettysburg, the 13,000 troops of the Union Sixth Corps had not been engaged. In my alternate history scenario, the defeated Union army has a similar number of fresh troops to defend the rest of the army while it recovered. The Union army’s retreat would have shortened its supply lines making it easier for the defeated Union army at Pipe Creek to be quickly resupplied. The Union had thousands of troops from which to make up its losses, including up to 100,000 troops that had just won the siege of Vicksburg. Some of those troops had been sent to Vicksburg from the East. One of the units sent in June was the 20th Michigan Infantry Regiment which included Anson Croman, my 2nd great-grandfather-in-law. The Union’s control of most of the major rivers, now including the Mississippi, the Gulf of Mexico, and the Atlantic Ocean combined with the best canals and railroads in the U.S. meant that the Union could quickly move troops from Vicksburg to the east. Without quick reinforcement and ammunition resupply, the Confederates would be unable to follow up their victory at Gettysburg. When word reached the Confederate capitol at Richmond of the disastrous loss of Vicksburg the Confederate government most likely would have recalled its army from Pennsylvania. On the south bank of Pipe Creek, the Union army would have seen the Confederates withdrawing. The Union army may not have recovered enough from its recent Gettysburg defeat to pursue the Confederates. In the East President Lincoln has an intact and formidable army that survived a defeat. In the West he has a major victory. While his job would be easier if he had two victories instead of one, he uses what he has to sustain Union morale, continue the war for almost two more years, and defeat the Confederacy. Among its features are illustrations of lines of sight at critical moments. General Lee’s July 2, 1863 viewpoint from Seminary Ridge. 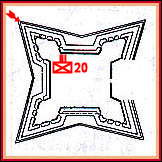 Regiment symbol north of Vicksburg above “Sherman”: Approximate location of the 20th Michigan from early June to the fall of Vicksburg on July 4, 1863. Regiment symbol north of Jackson: Approximate location of the 20th Michigan during the assault and recapture of Jackson, Mississippi on July 17, 1863. Public domain map from the U.S. Military Academy. 150 years ago on June 4, 1863, Anson Croman and the 20th Michigan were ordered to leave Kentucky and join General Grant at Vicksburg, Mississippi. On arrival the 20th Michigan was deployed north of Vicksburg under General Sherman’s command. 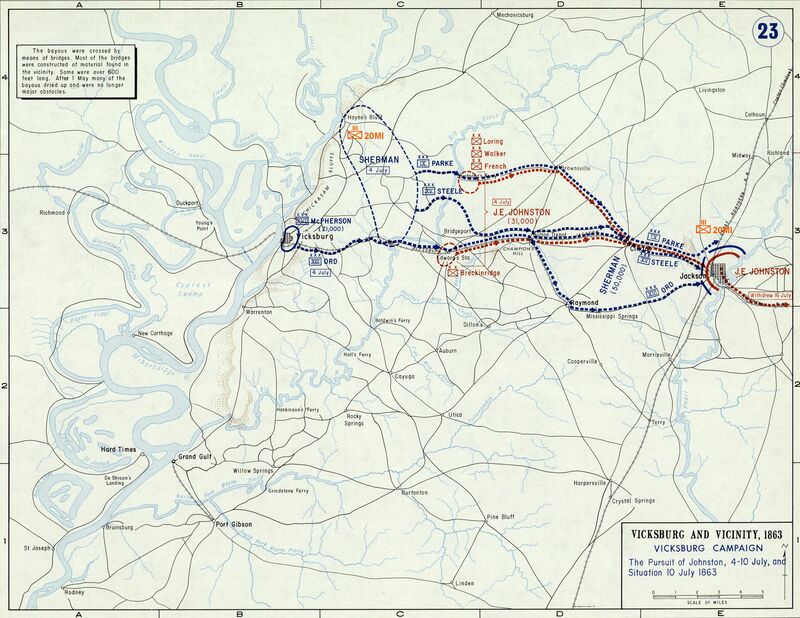 The main Union forces had surrounded Vicksburg. General Sherman’s forces were protecting their flanks from Confederate General Joe Johnston’s forces. On July 4, the day after the Confederates were defeated at Gettysburg, Pennsylvania, Vicksburg surrendered. Immediately afterward the Union army including the 20th Michigan chased General Johnson’s forces and by July 17 recaptured Jackson, Mississippi. After the Confederates retreated the 20th tore up railroads north of Jackson. The 20th Michigan remained near Vicksburg until August 4 when it returned to Kentucky. The capture of Vicksburg secured the Mississippi River for the Union and divided the Confederacy in two. At times the Union victory at Gettysburg overshadows their capture of Vicksburg. While the war continued for almost two more years, the Confederacy never recovered from those two losses. Both were equally decisive in the military defeat of the Confederacy. Copyright © 2013 USPS. Fair use. If Anson Croman wrote letters home, none have survived. Therefore the best way to preserve and share the story of his service is by sharing the history of his regiment. Records document that Anson Croman was with his regiment from his 1862 enlistment until the Confederate surrender at Appomatox, Virginia in 1865. The Musbachs and Robinsons are direct line descendents of Anson Croman and is my 2nd great-grandfather-in-law. On December 13, 1862, the Union assaulted Confederate positions. The major assault was west of of Fredericksburg and a smaller assault was made in the woods south of Fredericksburg. Anson Croman’s and the 20th Michigan’s remained in positions between the two Union assaults. They were not were not ordered to join either assault and suffered no casualties on December 13. The 20th Michigan withdrew across the Rappahannock River on the night of December 15-16, 1862. One member of the 20th Michigan was wounded during the withdrawal. The 150th Anniversary of The Battle of Fredericksburg ”Fire on the Rappahannock” by The Battle of Fredericksburg Commemoration Committee.